A wet fall and spring have left many Midwest farmers with several challenges as they prepare for planting. Before heading into the field, farmers should check with their local Pioneer agronomist to discuss soil compaction, corn planting depth and early soybean planting, which are covered below, or any other agronomic concerns. Feeding a growing global population requires consistent crop improvement. Corteva Agriscience™, Agriculture Division of DowDuPont, is at the forefront of research and agronomic knowledge to help growers increase their yields and crop quality. This week’s media briefs include corn planting tips, the benefits of burndown in cornfields and the use of bait stations. Flooding throughout the Midwest is preventing an early start to the season for many farmers. Pioneer agronomists know that farmers need a proactive plan to stay on track during and after #plant19. Our agronomists are available to answer questions and help farmers achieve yield goals. This week’s media briefs cover spring nitrogen, and wheat and alfalfa assessments. Spring has sprung and farmers across the country are planning and prepping for the planting season. Choosing the correct products, seeding rate and timing can be a challenge, but Pioneer’s team of local agronomists are available to answer questions and help farmers succeed in 2019. This week’s media briefs cover soybean seeding rates, molds and mycotoxins, effective burndown applications and the Corteva Agriscience™, Agriculture Division of DowDuPont, acquisition of Clearfield® canola. As spring is approaches, it’s time for farmers to scout wheat fields for winterkill or heaving issues. This week’s media briefs also include information on early soybean planting, foliar diseases and the selection of two new members of the future board of directors for Corteva Agriscience™, Agriculture Division of DowDuPont. #Plant19 has already begun in the south! Pioneer field agronomists are answering farmers’ questions to help deliver a strong 2019 growing season. This week’s media briefs highlight using the Pioneer.com GDU calculator, water retention’s effect on nutrient availability, soil temperature and corn emergence, and the importance of resistance rotation in insecticides. We enjoyed seeing many of you at Commodity Classic last week in Orlando, Florida. If you couldn’t attend, or didn’t get to speak with the expert you wanted, we are happy to arrange an interview. This week’s media briefs cover the real-time drone mapping through an agreement with DroneDeploy; a Corteva Agriscience™, Agriculture Division of DowDuPont, pipeline update; a research collaboration with ZeaKal; and forage digestibility. It’s that time of year again; Pioneer will be at Commodity Classic in Orlando, Florida, Feb. 28 – March 2. 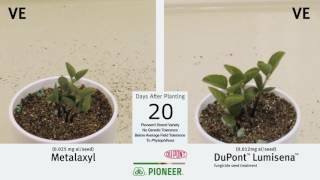 We’re excited to bring the latest technology updates and our industry-leading agronomic information to the Corteva Agriscience, Agriculture Division of DowDuPont, and Pioneer Stage, located in the Pioneer booth, (#875) throughout the event. This week’s media briefs cover the Pioneer Commodity Classic stage schedule, the case for using digital solutions in farming and five ideas to maximize soybean potential. Want to speak with an expert on these or other topics? Contact Kacey Birchmier at kacey.birchmier@dupont.com. One of the fastest changes in modern agriculture has been the rise of precision agriculture. These tools leverage seasonal data and turn it into actionable insights and plans. Pioneer’s Encirca® services and Encirca certified services agents help growers make the best decisions for their operations, in season and out. This week’s media briefs cover the symptoms of macronutrient deficiency in corn, Mexican bean beetles and hybrid response to plant population. For farmers, each season brings a series of never-ending decisions, balancing the risks and rewards of everything from preseason fertility and seed selection to in-season management techniques. Pioneer agronomists are always available to answer questions. With expertise and access to one of the industry’s most robust catalogs of agronomic information, they can provide farmers with information to make the right decision every season. This week’s media briefs cover twin-row corn production, soybean cyst nematodes and spider mite management in corn. JOHNSTON, Iowa, Jan. 4, 2019 — Fifteen Iowa and Illinois FFA chapters will showcase their creativity in the Pioneer®brand A-Series soybeans Big A Challenge, with their masterpieces displayed at the 2019 Farm Progress Show in Decatur, Ill.
CHS Inc. (CHS) will offer production contracts for Pioneer® brand Plenish® high oleic soybeans for 2019 production. Des Moines, IA, Sept. 12, 2018 — Just like Pioneer® brand A-Series soybeans are next-generation varieties helping growers achieve the highest yield potential on their farm, FFA helps the next generation of growers meet tomorrow’s challenges head on. Together, they are teaming up for the Pioneer® brand A-Series Soybeans Big A Challenge. ATLANTA, GA and DES MOINES, IA, July 19, 2018 — UniPro Foodservice Inc. and Corteva Agriscience™, Agriculture Division of DowDuPont, today announced the introduction of UniPro’s new, high-performance soybean oil known as Versa™ Premier High Oleic Soybean Frying Oil. JOHNSTON, Iowa, June 19, 2018 — Corteva Agriscience™, Agriculture Division of DowDuPont, brand products are synonymous with crops. However, it may come as a surprise that many agricultural crops are dependent on bees, moths and other insects and animals to help pollinate those crops. To celebrate National Pollinator Week and support pollinator health, employees at the Johnston, Iowa Corteva Agriscience campus are gathering on June 22 from 9 a.m. to 3 p.m. to construct a Pollinator Demonstration Garden. A brief program will be conducted at 9:30 a.m. As part of the festivities, First Gentleman Kevin Reynolds, husband of Iowa Governor Kim Reynolds, will be on hand to help plant the garden and to promote his pollinator health and habitat platform. MANHATTAN, Kan., June 19, 2018 — With more than two million service members transitioning from the U.S. Armed Forces back to civilian life, the Servicemember Agricultural Vocation Education, or S.A.V.E. Farm, aims to bridge the gap between that workforce and the aging population of most American farmers. To aid the nonprofit in creating programs that provide agricultural training, Corteva Agriscience™, Agriculture Division of DowDuPont, is sponsoring a half-day workshop Friday, June 22, 2018. Des Moines, Iowa, June 6, 2018 — Analysis of 30 years of corn plant population responses shows that as agronomic optimum plant density increased, the range for maximizing corn yields also widened. This means modern hybrids benefit from increased plant populations without the previous instability that resulted from higher populations. Study findings show a 53 bu/A yield increase. Des Moines, Iowa, May 29, 2018 — Sukup Manufacturing Co., based in Sheffield, Iowa, was awarded the 2018 innovationLEADER Award. The award is designed by the Des Moines Business Record, and sponsored by Corteva Agriscience™, to recognize an Iowa business or organization for its culture of innovation and revolutionary ideas. Steve Sukup, chief financial officer, Sukup Manufacturing, accepted the award on Thursday, May 24, 2018, as part of the innovationIOWA awards banquet held at the Carver Center on the Johnston, Iowa campus of Corteva Agriscience™.